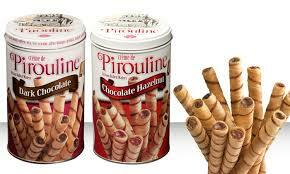 I just felt like sharing I love Pirouline cookies. I frist tried them when my wife (knowing my love of wafers and cookies) bought me some she saw at the store. I was instantly enamored. These tasty rolled-wafer style cookies are amazing in the, "Dark Chocolate," variety and I was so struck by the delicious taste I wrote the customer service email about how great the cookies were. In a sign of how Pirouline cares about their customers they actually wrote me back with thanks for my kind words and offered to send me some coupons. I gave them my address and not too long after I got in the mail coupons I put toward more wafery-choclately goodness. I would without a doubt recommend you try Pirouline cookies, and if you're a lover of Hazelnut you'll be pleased to know they have that flavor too, as well as occasional limited-time ones. For real though, give these cookies a taste, you'll be pleased! Note: The people who make Pirouline cookies were not aware I had a blog or that I was going to write a post about their cookies when I contacted them the first time and they offered me coupons. I just felt like making a post!